A while back Julia made Pink Leek Pasta and from what I remember it was quite delicious. I saw pre-packaged leeks at Trader Joe’s during my last trip and I immediately thought to make some PLP. I followed the same steps except that I halved it but put in all of my leeks. I had quite a bit left over for a few days and I couldn’t get enough. This is so simple, quick, easy, pretty and ridiculously delicious. I think next time I’m going to throw in some chicken. Yum! i love clam chowder. i’ve consumed it at many restaurants and have made it out of a can a few times, but i’ve never actually tried making it from scratch. i came across this recipe at epicurious.com and thought it seemed pretty simple. after sending it over to ian for further review, i went ahead and made it for our weekly hanging out of watching tv trash-ness. drain the clams and combine that juice with enough bottled juice to equal 3 cups. the juice from three cans and one bottle of clam juice will be enough. cook the bacon in a soup pot over medium heat until crisp. add the onion and cook until translucent, stirring occasionally. add the flour and stir over low heat for about 2-3 minutes. whisk in the clam juice and bring to a simmer. cook for 5 minutes. if the liquid is too thick, add more clam juice to adjust. add thyme. add the potatoes and simmer for about 15 minutes or until tender. add the cream and clams once the potatoes are cooked. serve with oyster crackers or crispy bread, seasoning with tobassco sauce and worcestershire to taste. there is no photo. why? simply because i forgot to take one. probably because i was enjoying this too much to take one. sorry! at any rate, this has been the best clam chowder i’ve had in a long time. and really, really simple to make. warm, creamy, potato-y with a hint of clam. perfect for dinner on a cold night. enjoy! Every once in a while I like to do a “featured reader” post. It takes the “burden” of cooking off of me but it also lets me showcase the delicious meals my friends make. This post is courtesy of Julia who was given the recipe by her trainer. Julia says it is a cinch to prepare and quite scrumptious. 1. Cut up all but the top two inches of the green part of the leeks. 2. Soak them and rinse them a few times as these are extremely dirty! 3. Saute the leeks with some olive oil until they are soft. 4. 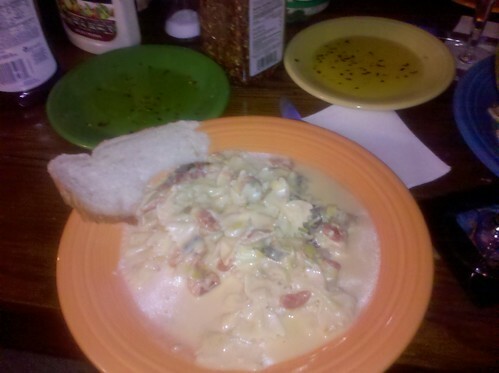 Add the tomatoes, cream, garlic and salt and pepper to taste. 5. Reduce the sauce until it thickens a bit. 6. 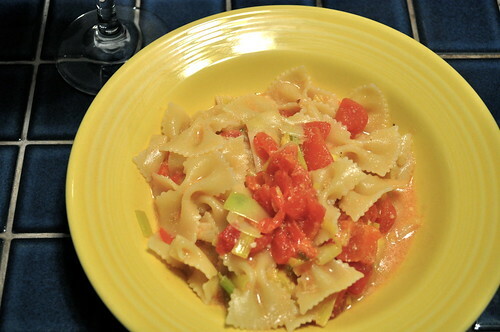 Cook the bowtie pasta and toss it into the sauce. I started the meal off with crusty bread and dipping oil, a tossed salad and white wine while the sauce continued to thicken. Once everyone was done eating the pasta was ready to be served. Everyone was pleased with the meal and it was quite simple to make. If you prepare this meal for a larger group, I suggest cooking the sauce in two smaller pans or give yourself more time to let the sauce reduce to the correct thickness. looks delicious, Julia! Thanks for the post! I will be trying this in my new kitchen sometime soon.